DAYTONA BEACH SHORES - The "tink" of wooden paddles on a bright-orange wiffle ball was unmistakable one recent Friday morning over on court nine at this city's public-access Oceans Racquet Club. There's more of it going on over at McElroy Park. Every Monday, Wednesday and Friday morning. "My wife, she teaches Zumba, and she calls it 'exercise in disguise,'" said 67-year-old Peter Mitchell of Port Orange between games. "This is exercise in disguise. The tennis players, they might roll their eyes, but the name of this place is racquet club. The sign didn't say tennis club." The atmosphere isn't hostile at all, though. By all accounts, pickleball, while perhaps garnering scoffs from serious athletes of more established racquet sports, isn't a walk in the park. 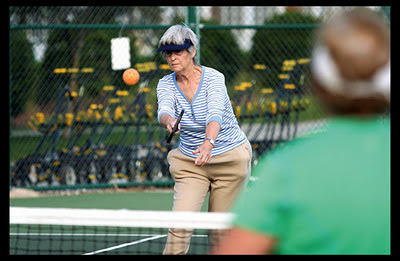 Played with a wooden paddle and wiffle ball on a concrete badminton court divided by a tennis net, pickleball melds the rules of all those games, with a pace and breadth that isn't quite as taxing as tennis.